Standards and regulations form an inherent part of international trade. This column presents evidence – based on two novel datasets – that suggests that for firms the distinction between voluntary standards and government regulations is blurred, that export revenues of small firms are hit twice as hard by burdensome regulations as those of large firms, and that firms active in larger markets have access to a higher number of voluntary standards. In light of increased demand by consumers for sustainability and protection (Hainmueller et al. 2015), standards and regulations have started to form an inherent part of every stage of a firm’s internal value chain (Porter 1985) and its interactions with suppliers and customers. They affect both support activities – such as management, accounting and finance – and primary activities – such as logistics and operations. In the second issue of its flagship publication, SME Competitiveness Outlook 2016, the International Trade Centre (ITC) examines how standards and regulations affect firms, and notably small and medium-sized businesses, in their ability to compete internationally. For these purposes two ITC databases have been explored econometrically for the first time: the ITC Non-Tariff Measure (NTM) Business Surveys, and the ITC Standards Map covering data on voluntary sustainability standards (VSS). ITC NTM Business Surveys capture how businesses experience non-tariff measures – independently of whether this effect is intended by regulatory authorities. The survey notably allows to distinguish between regulatory and procedural obstacles created by the NTM.1 The most disaggregated information from the ITC NTM Business Surveys is available at the firm-product-destination level.2 For each product-destination pair where a firm exports, we know if the firm faces a challenging regulatory obstacle or procedure associated with that regulation, or both regulatory and procedural obstacles. For the purpose of the research, the ITC NTM Business Surveys data on technical regulations have been merged with the World Bank Exporter Dynamics Dataset. The latter notably contains cross country comparable indicators of firm dynamics, firm-product and firm-destination dynamics. The study by Rollo (2016) uses several of the available measures at the country-year-sector-destination level, from a selection of 18 countries for the 2010-2014 period. Using fixed-effect estimations, the paper assesses the relationship between exporters’ revenue and the perception exporters have of the regulatory environment in their countries. Results show that burdensome technical regulations can stymie export values, particularly those of smaller firms. The value of exports per firm, averaged across firms, declines in markets where the frequency of encountering burdensome regulations rises. Interestingly, the magnitude and the statistical significance of the decline are found to decrease as the size of the firm increases. A 10% increase in the frequency ratio of small, medium-sized and large firms is associated, respectively, with a 3.2%, 2.6% and 1.6% decrease in the export value. In other words, small exporters are found to be more negatively affected by regulatory or procedural obstacle associated with technical regulations. This is consistent with the findings from the literature, indicating that smaller firms react more strongly to changes in trade costs (Berman et al. 2012, Gopinath and Neiman 2014, Spearot, 2013). Costs associated with technical regulations more generally affect the capacity of firms to compete (Figure 1). A higher frequency of technical regulations is associated not only with a decline in the average value of firms’ exports but also with a higher exit rate and lower product diversification. 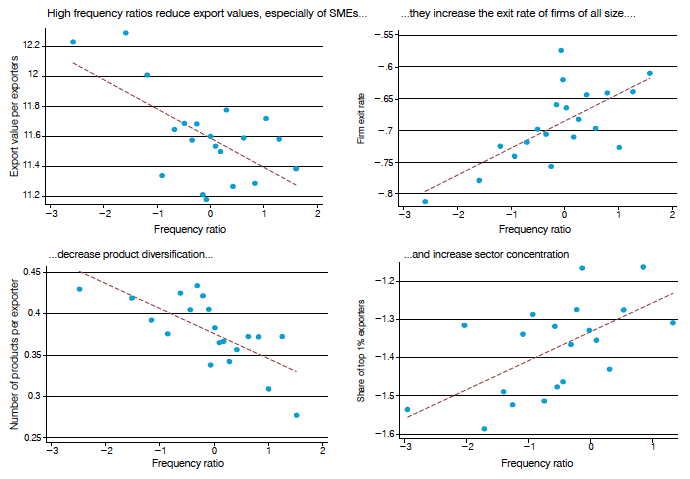 Interestingly, the frequency ratio is also positively and significantly correlated with the market share of the top 1% of exporters (a proxy for market power), and negatively and significantly correlated with the number of exporters per product (a proxy for the degree of domestic competition). Together these findings indicate that technical regulation costs may discourage the worst performing firms and push them out of the market, leaving the field entirely to the most productive firms. This may contribute to an increase in concentration and a consequent decrease of domestic competition in the sector. These results are in line with the prediction of the heterogeneous firms’ trade theory (Melitz 2003). The inclusion of additional costs of exporting is expected to push some firms out of exporting, therefore reducing the total number of exporting firms and increasing concentration. Note: The relationship between the two variables is the result of a binned scatterplot, using sector-fixed effects. The reported variables are defined in the natural logarithm. Source: Rollo (2016) calculations based on ITC NTM Surveys and World Bank Exporter Dynamics Dataset. Based on experience from the ITC NTM Business Surveys, firms do not appear to differentiate between standards set by private firms or NGOs and regulations set by governments. What matters is whether a rule is binding in order to enter a particular market. Data from the ITC Standards Map provides further evidence that the lines between governmental regulation and voluntary standards are blurred. The Standards Map database covers more than 230 standards systems offering detailed information on various aspects of their design and governance. The dataset covers standards that are developed by NGOs or civil society organisations, pursuing purposes such as environmental protection and social rights. Examples of such standards are Fairtrade and the Sustainable Agriculture Network. Standards can be also set by businesses; these can be either producers who set standards for the purpose of product differentiation vis-à-vis their competitors, or retailers who develop their own standards for regulating supply. One dimension common across standards systems is the interaction with intergovernmental regulatory frameworks such as International Labour Organization (ILO) core conventions, WTO agreements, etc. 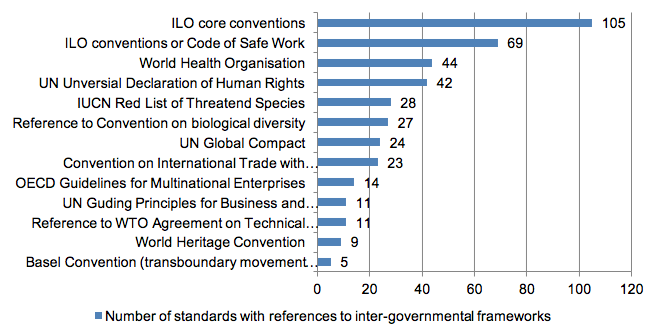 Figure 2 reports the number of standards systems in the Standards Map that include references to these intergovernmental schemes. Note: The figure includes only frameworks resulting from governmental collaboration. The analysis is based on 180 standards. Each standard can refer to more than one framework. Source: Fiorini et al (2016) calculations based on Standards Map database. Furthermore, the data cast doubt on the common belief that standards are primarily a matter for industrialised economies. While most voluntary standards do originate in the industrialised world, judging by where their headquarters are located, the trend is shifting. Between 2010 and 2015, more than one-third of new voluntary sustainability standards originated in non-OECD countries. According to ITC’s Standards Map, standard setters are particularly active in Brazil, Colombia, India, Kenya, and South Africa. The Standards Map database also captures another type of geographical scope. Each standard setter reports the current scope of certified operations, i.e. the countries where VSS have producers who have gone through an audit and verification or certification procedure and comply with the requirements of the voluntary sustainability standards. Figure 3 uses this information to reflect how many voluntary sustainability standards operate at the individual country level. Developing countries, especially large economies, turn out to have as many standards operating as developed countries. Notes: The relative darkness of the colour indicates a greater number of standards initiatives that operate in each economy, i.e. have at least one producer certified. The statistics are based on 180 standards. Source: Fiorini et al (2016) calculations based on ITC Standards Map. Country size turns out to be a significant determinant of the number of voluntary sustainability standards in a first assessment of determinants of standard availability at country level. Other determinants explored are GDP per capita and business competitiveness. The underlying assumption is that countries where firms are more competitive find it easier to comply with the requirements of standards. The competitiveness concept developed in ITC (2015) is applied in the regressions. A linear regression model at the country level indicates that the strongest individual predictor of standards availability is GDP. Once GDP is controlled for, per capita income is not a significant predictor. A higher competitiveness score is associated with higher access to standards. When distinguishing between factors affecting competitiveness at the firm level, in firms’ immediate business environment or at the national level, firm-level capacity turns out to be the determining factor. More specifically, it is the capacity of medium-sized firms that is most strongly associated with availability of standards at the national level. This finding suggests that – as in the case of government-imposed regulations discussed above – only the more competitive firms are able to go through the processes necessary to meet voluntary sustainability standards and prove it through certification. Standards and regulations represent an inherent part of international trade because of the increased demand by consumers for sustainability and protection. At the same time, they represent a significant cost for firms because of the costs associated with both, meeting standards and proving compliance. Evidence presented discussed in this column confirms that such costs effectively restrain smaller producers from exporting. Presented evidence also suggests that the voluntary standards imposed by private for-profit or non-profit actors have similar economic effects as regulations imposed by governments. Together, this evidence provides support for efforts towards mutual recognition or harmonisation of regulations and conformity assessment procedures that are ongoing at the regional and multilateral level, as such efforts contribute to reducing related costs. The evidence also suggests that there may be benefits from including voluntary standards in relevant discussions. Berman, N, P Martin, and T Mayer (2012), “How Do Different Exporters React to Exchange Rate Changes?” The Quarterly Journal of Economics 127(1): 437–92..
Gopinath, G and B Neiman (2014), “Trade Adjustment and Productivity in Large Crises.” American Economic Review 104(3): 793–831..
Hainmueller, J, M J Hiscox, and S Sequeira (2015), “Consumer Demand for Fair Trade: Evidence from a Multistore Field Experiment”, Review of Economics and Statistics 97(2): 242-256. ITC (2015), SME Competitiveness 2015: Connect, Compete and Change for Inclusive Growth, Geneva. ITC (2015b), The Invisible Barriers to Trade: How Businesses Experience Non-Tariff Measures, Geneva. ITC (2016), SME Competitiveness 2016: Meeting the Standard of Trade, Geneva. Melitz, M J (2003), “The Impact of Trade on Intra-Industry Reallocations and Aggregate Industry Productivity.” Econometrica 71(6): 1695–1725. Porter, M E. (1985), The Competitive Advantage: Creating and Sustaining Superior Performance, New York: Free Press. Spearot, A C (2013), “Variable Demand Elasticities and Tariff Liberalization”, Journal of International Economics 89(1): 26–41. The product is defined at the 6 digit level of the Harmonised System (HS). The frequency ratio is then weighted by the restrictiveness of the burden associated with each NTM chapter, calculated from a reduced sample of the ITC NTM Business Surveys.